One of China’s most traditional plucked string instruments, the Chinese sanxian (or xianzi) has been passed down over many generations. It was wildly popular when brought to Japan, resulting in the creation of the shamisen. True to its name, the instrument possesses san (three) xian (strings). Although the history of the Chinese sanxian is rich, unfortunately, not much of it has been recorded. The sanxian’s role in history is not accurately reflected through the limited historical material available to us today; both scholars as well as musicians are unable to glean a completely reliable history of this Chinese instrument. The lack in information of this Chinese shamisen-lookalike seems to be due to the fact that, for a long while, the sanxian had no fixed name nor shape. Different names and shapes would be used across varying provinces. Nevertheless, it has been concluded that before the Liao Dynasty, the sanxian - alongside various other plucked string instruments - was referred to by the term pipa, qin hanzi or qin pipa. 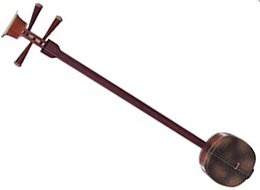 Not unlike numerous other Chinese instruments, the sanxian was also reformed to cater to the needs of the Chinese orchestra. Prior to reformation, the sanxian was typically used as an accompaniment to quyi (song), and was deemed incapable of playing significantly difficult pieces. With the liberation of China, sanxian musicians began to alter various parts of the instrument, such as its shape, strings and bridge. In order to make performance easier, a metal support stand was also added. The first new-and-improved sanxian model was produced in 1980. The instrument was then revised again in 1986, making the instrument even easier to play. Today’s sanxian comprises of the following three modernized parts: a sound box, tuning pegs as well as three metal or nylon strings. As it is the only plucked string instrument in the Chinese orchestra that makes use of a snake skin membrane, the tonal quality of the sanxian is extremely unique, folksy and bears a lot of character. While the ruan and pipa are fretted, the sanxian uses a flat and fretless fingerboard: this allows the performer’s left hand to freely explore unique performance techniques and bend pitches, though with the requirement of much expertise. Nevertheless, the numerous glissandos that the it is capable of executing contribute to the sanxian’s characteristic sound. Want quality Sanxians from a trusted source?